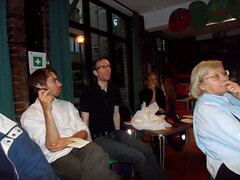 John addressed Camden Cyclists meeting on 15 June 2015. 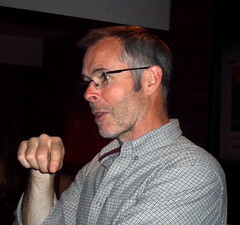 He is the founder of Urban Movement (UM), chair of the Transport Planning Society (TPS) and a trustee of Living Streets. He tweets as @johnstreetdales – an indication that streets are his main interest; cycling is also very important and we mustn’t forget walking. John started by saying that “Vision is what it might be” –and using the quote “without a vision people perish”. He said “there’s a lot of work to do, sorting the gyratory for a start…what’s needed is quite challenging, not least the displacement of traffic. But our vision is the kind of thing that’s needed London wide”. The space that cyclists need will be used efficiently and we need to cater for additional demand from people who have not yet been engaged. 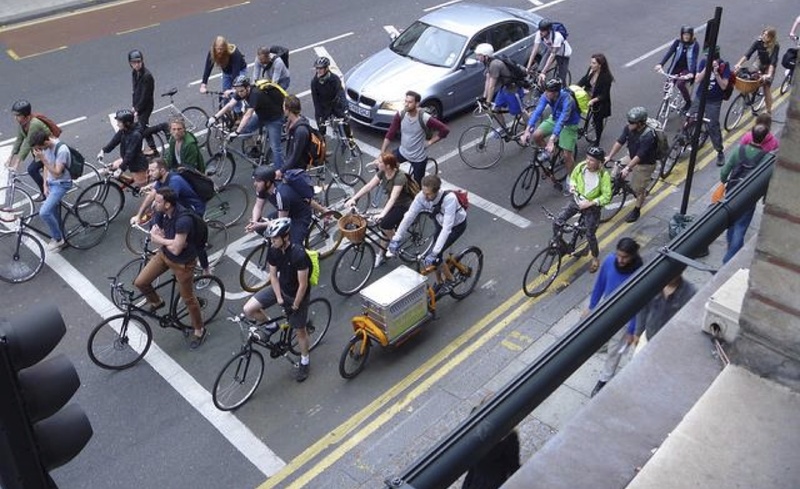 – consider a cycle street as in Holland: get rid of all but buses… but that’s not going to be quiet enough because the flow of buses far exceeds the limit for comfortable sharing. 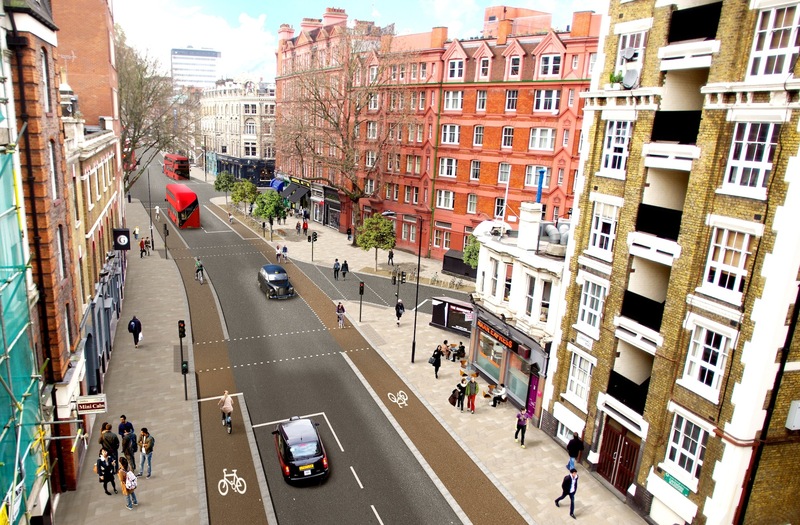 – therefore we need segregation; measurements have shown that on the whole alignment from Theobalds Road to Old Street (apart from Clerkenwell Bridge) the carriageway width is 10 metres or more. Ten metres is just right for accommodating a pair of 2m wide cycle tracks and a pair of 3m wide motor lanes. Where there is additional space, bus stops, loading bays, trees, seating and so forth can be added to enhance the street scene. 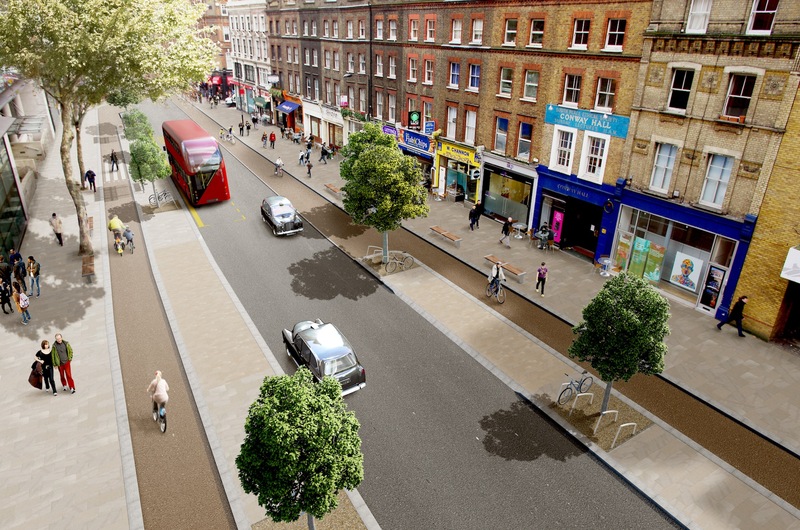 – Nick Kocharhook asked whether Islington are justified in using 3.25m for motor lanes… John replied that all you need is room for two motors to pass – including wing mirrors although the latter sometimes overlap the footway/cycle lane. This might suggest kerb separators for cycle tracks, but John thinks these to be poor in streets. Old Shoreham Road Brighton has 6.1 m for motors (with stepped tracks for cycles). John asked: “why was 3.65m so popular?” and James Brander replied: “because it’s 12 feet”. James also said that “2m is not enough” but John said: “this is a reasonable amount”. We could start by introducing “bus gates” at each end of Theobalds Road to prevent other motors from travelling end to end. These could use cameras and/or rising bollards. People might say: “what about High Holborn?” but we must start somewhere e.g. with a trial and see what follows. (Things still worked after the fire in Kingsway). But when building cycle tracks (space for cycling) it is best to make it permanent so as to be sure to keep the space gained – in such situations, don’t build with something easy to move like armadillos. A “10 metre ribbon” was applied along the length of Theobalds Road so as to see what extra space is left and where… so as to locate bus stops and so forth. John showed photos of the wasted space in the middle of the carriageway (islands, refuges, hatched areas)… as an aside, he bemoaned the ubiquitous over use of the 610 bollard – which is never mandatory. Next, a CAD drawing was made (by Oliver Davey of UM) to show in detail with measurements how the road space can be used in a section of Theobalds Road between Proctor Street and the police station on the corner of Lambs Conduit Street, illustrating the benefit of a continuous buffer strip between cycle and motor lanes… common in Copenhagen.. bus stops, loading and so forth fit in naturally. This led to a discussion of loading across cycle lanes… but John pointed out that this involves a small number of predictable vehicles, best done outside busy times. David Arditti asked about the difficulty of relocating trees… and John pointed out that keeping the original kerb line immutable solves this problem.. although you can widen the footway. John mentioned that in Seville they built 500m of cycle track every week for 4 years – using lightweight segregation, two-way tracks built by taking one motor vehicle lane and a commitment to move no trees. 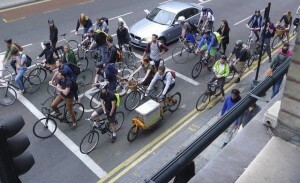 There is space for the existing motor traffic, but it needs filtering to avoid slowing the buses. The location chosen for the visualisation was at the junction of Rosebery Avenue. Views of the road surface show that only half the carriageway is needed for motors and the rest can be given to cycling. If Theobalds Road is ‘gated’, this may be sufficient to reduce traffic in Clerkenwell Road. 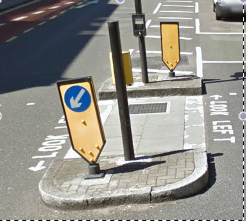 The potential left hook for cycles going straight ahead eastbound might be addressed by a separate signal. A separating kerb could be used to encourage cyclists not to try to use the motor green. On the other side of the road (where there is no side road), cycles could be allowed to go at all times, but a small zebra would protect pedestrians who would need to be able to stop (on an island with a signal) … if there’s room. The cycle stop line is shown ahead of the motor stop line. The CAD drawing for this junction is here. But whatever is done must be consistent throughout. As before, the visualisation was drawn over a photo taken from a cherry picker (see below). When questioned about time scales for implementation, John replied that this was a sales pitch, not a plan, but if approved, could be done in 1-2 years. He felt that Camden would be very supportive but were very stretched with other projects and TfL would have a veto. However, some parts, e.g. dealing with the gyratory at Holborn/Kingsway, could be done early. Another question was about Westminster’s attitude; he replied that we should build what we can and they would follow.